The air is getting warmer. The freesias have pushed up along the sidewalks. Spring is the perfect time to freshen your clothes and your closet. And you are just beginning to believe that spring might actually be here. Before the weather beckons you outside, spend one more day inside and spring clean your closet. This is the perfect opportunity to clean and put away winter clothes and get your summer duds in gear. Sound overwhelming? No problem. Just take it step by step. Here's how to spring clean your closet. Most people (unless they live in Miami) have a summer wardrobe and a winter wardrobe - even if the word "wardrobe" sounds a bit fancy for the clothing in their closets. Clothes that are clean, in good condition, and that you will definitely wear this summer. Clothes you have outgrown and never wear. You know the drill here. Donate the outgrown or never worn clothing. Clean and repair the rest. Box up the winter clothes for a rest. While the closet is empty, vacuum it well and wipe down all shelves. 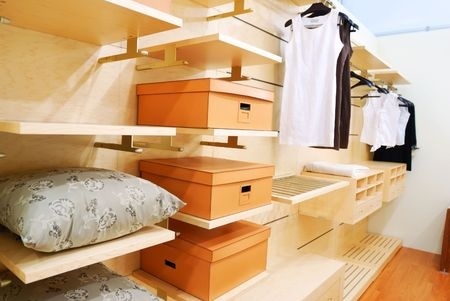 Now you have the closet ready for clothes that you are actually going to wear. What a concept! Here's how to take the best care of what you have left. Use cedar balls or blocks to ward off moths. The newer variety today don't smell as bad as you may remember, and do plenty of good by keeping munching moths at bay. Use proper hangers. Don't use the flimsy wire things that you get from the dry cleaners. They don't provide enough support, plus they can rust or snag clothing. Invest in curved wood or plastic hangers for suits and jackets. Choose padded hangers for delicate dresses or silk robes. Use plastic hangers for blouses and jeans. And clamped hangers for pants (always hang from the cuffs). To save space, buy the multiple skirt or pants hangers that will accommodate five to 10 garments. Never store clothing in plastic bags, which can promote mildew and light damage. Do use plastic shoulder protectors to keep dust off rarely worn garments. Space clothing out to promote airflow and to minimize wrinkling. Air out worn clothing overnight before returning it to the closet to rid it of any moisture or odors. And finally, don't be like your kids and wear the same thing every day. Clothing needs a rest. (Shoes, too.) If you like it that much - buy two.